Scientists at Rice University and the University of Houston have developed a single catalyst that can simplify the splitting of water into oxygen and hydrogen to generate clean energy. A three-layer structure of graphene, nickel and a compound of iron, phosphorus, and manganese form the electrolytic film produced at Rice and tested at Houston. While the metal phosphide carries out the reaction, the foamy nickel offers the film a large surface and the conductive graphene safeguards the nickel from degrading. 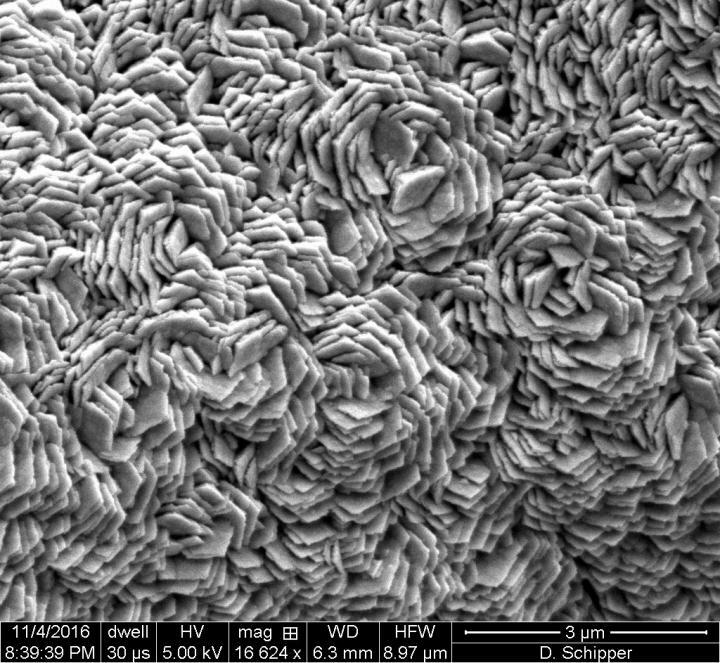 The robust material is the subject of a paper published in Nano Energy. The film was exclusively designed by the Houston Electrical and Computer Engineer Jiming Bao and Rice Chemist Kenton Whitmire and their labs to overcome obstacles that generally make a catalyst ideal for producing either hydrogen or oxygen, but not both at the same time. Regular metals sometimes oxidize during catalysis. Normally, a hydrogen evolution reaction is done in acid and an oxygen evolution reaction is done in base. We have one material that is stable whether it’s in an acidic or basic solution. The findings are based on the Researchers’ creation of a simple oxygen-evolution catalyst unveiled earlier this year. In that work, the team grew a catalyst directly on a semiconducting nanorod array that converted sunlight into energy for solar water splitting. A cathode and an anode were the two catalysts required for electrocatalysis. When kept in water and charged, oxygen will form at one electrode and hydrogen at the other, and these gases are captured. However, to operate as effectively as the Rice team’s catalyst, the process typically needs costly metals. The standard for hydrogen evolution is platinumWe’re using Earth-abundant materials — iron, manganese and phosphorus — as opposed to noble metals that are much more expensive. If you want to make hydrogen and oxygen, you have to put in energy, and the more you put in, the less commercially viable it is. You want to do it at the minimum amount of energy possible. That’s a benefit of our material: The over potential (the amount of energy required to trigger electro catalysis) is small, and quite competitive with other materials. The lower you can get it, the closer you come to making it as efficient as possible for water splitting. The most important parameter in protecting the underlying nickel is graphene, the atom-thick form of carbon. The nickel foam in a chemical vapor deposition (CVD) furnace is responsible for the formation of one to three layers of graphene, and the phosphorus, iron, and manganese are added on top of that, also through CVD and from a single precursor. It was discovered that the conductive graphene lowered charge-transfer resistance for both oxygen and hydrogen reactions by the tests carried out by Bao’s lab that compared both phosphide and nickel foam with and without graphene in the middle. “Nickel is one of the best catalysts to make graphene,” said Co-lead Author Desmond Schipper, a Rice Graduate Student. “Essentially, we’re using the nickel to help improve the nickel.” He said the manganese also adds a level of protection. Whitmire said the material is scalable and must find use in industries that produce oxygen and hydrogen or by wind and solar powered facilities that can use electrocatalysis to store off-peak energy. Sophisticated materials may also be generated if this method is adapted. “Our method could be widely applicable to a large number of metal phosphide materials for catalysts — not just for water splitting, but for a range of things,” he said. A critical factor is that we’re able to make phase-pure materials with different compositions. Currently, people have very little control over the phase they get on a surface, and in many cases they get a mixture. When that happens, they don’t know which phase is actually responsible for the catalysis. With our process, they can know. Zhenhuan Zhao of the University of Houston and the University of Electronic Science and Technology of China, Chengdu, is Co-lead Author of the paper. Co-authors are Hari Thirumalai, Lixin Xie, Fan Qin, Kamrul Alam, Lars Grabow, Shuo Chen, Dezhi Wang and Zhifeng Ren of the University of Houston and Zhiming Wang, Jing-Han Chen and Andrew Leitner of Rice. Whitmire is a Professor of Chemistry and Associate Dean of the Wiess School of Natural Sciences at Rice. Bao is an Adjunct Professor at the University of Electronic Science and Technology of China and Associate Professor of Electrical and Computer Engineering at the University of Houston. The research was supported by Rice University, the National Science Foundation (NSF) and the Robert A. Welch Foundation. The University of Houston uHPC cluster, the NSF-supported Extreme Science and Engineering Discovery Environment and the Department of Energy Office of Science National Energy Research Scientific Computing Center provided the computing resources.